The tapes, Mr. President, the tapes! It's not surprising that Richard Nixon is the subject of so many theatrical undertakings. Of all the figures in modern political history, he is by far the most Shakespearean. And of all the dramatic foils for Nixon, who could rank higher than the one Nixon created for himself, Henry Kissinger? It is their duet that forms the eighty minute Nixon's Nixon. It takes place at a moment in history, the eve of Nixon's resignation, that certainly seemed monumental in importance to both of them. They were not, however, fretting over the impending constitutional crisis; these two men were concerned with history: not how it would judge this moment, but rather how it would assay them. MCC presents this play in commemoration of the tenth anniversary of its debut, with the original cast as well as the director and set designer intact. The original was positioned twenty-plus years after Nixon's resignation, and shortly after Nixon's death and the partial rehabilitation of his reputation that preceded it. We now see it from a different vantage point -- in which Watergate has become more of a historical curiosity, but "politics as usual" has come to incorporate the cynicism and distrust it engendered. It's also informed by the recent revelation that Kissinger currently and regularly advises George W. Bush. Russell Lees writes an imagined evening of conversation, posturing, delusion, decision and drink, emanating from a non-fictional source. 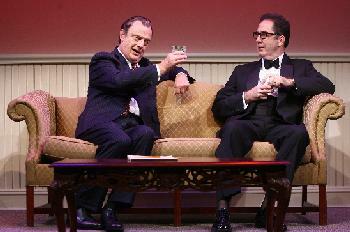 Kissinger (Steve Mellor) did indeed pay Nixon (Gerry Bamman) a visit at the eleventh hour of his imploding presidency. Was Nixon actually as unhinged as Lees suggests? Was Kissinger's purpose really as self-serving as it is presented? Did the two of them actually contemplate creating an international crisis as a way out? Only one living person knows, and he's not likely to talk about it any more than he has. So Lees gets free reign, and he relishes the opportunity. It's not a superficial treatment, though one might have hoped for more trenchant insight and less satire. Still, there's much fun for history buffs in the "game" the two men play reënacting some of the huge moments of the fabled Nixon/Kissinger diplomacy. There are also glimpses of quite personal poignancy -- most notably, perhaps, Nixon's clear affection for his daughter Julie, and Kissinger's appreciation, as a pre-teen, of what it meant to him to be in America. Jim Simpson's direction goes with the satirical flow, at the expense of a more character-driven examination. Both actors are made up to look like the two men, and take a shot at impersonating their distinct voices and speaking styles. Mellor's Kissinger is more understated and successful; Bamman seems to find a Nixon that's somewhere between the real thing and the (perhaps more memorable) Saturday Night Live version thereof. (I did not see the original production, but a bit of research discloses that no effort at such re-creations was attempted the first time around.) I found both to be more distracting than beneficial. That said, both Bamman and Mellor are fine actors, who acquit themselves well overall. Bamman gives us a Nixon with broad philosophical sweep, who nonetheless seems much like a child at play with his daydreams. Mellor presents Kissinger with an insecurity and desperation that is barely concealed behind his well-known, if faux, Teutonic veneer. The staging, set design, lighting and projections also do not serve the production well. The entire play takes place in the Lincoln Sitting Room of The White House. Kyle Chepulis' set -- wide and shallow on the Lortel stage -- places the audience in the interior wall opposite the windows. The action is thus largely played into that wall, so that the opportunity for the actors to interact -- and that's what the play is about, presumably -- is subverted. Worse yet are the projections, which change (as does the lighting) each time the men commence their numerous reminiscences: yet another diversion. Late in the play, another ill-advised and totally unnecessary projection flashes photos of the war dead as Nixon catalogues the death toll on his watch. Together, these choices remind us how easy it is for technology to undermine good story-telling. Which brings us back to Shakespeare. The play ends by shifting to Bamman reciting Nixon's famous "goodbye to the staff" speech on the morning his helicopter took off from the White House lawn for the last time. The words and the message are pure, unadulterated Nixon -- no Safire or Buchanan needed, thank you very much -- and it's as close as Nixon's Nixon ever gets to the Bard.